For two hundred years since 1805 the tale of St. Peter's Episcopal Church has been entwined with the story of the historic city of Auburn, New York. From the close of the American Revolution to the development of nineteenth century industry, Auburn has had significance as the location of international manufacturing and as the home of William Henry Seward. Thanks to the preservation of St. Peter's vital records, an account of the venerable parish's involvement in Auburn's history has been professionally written by the Rev. Robert Curtis Ayers, Ph.D.
Dr. Ayers specializes in ecclesiastical history and is Rector Emeritus of the present Auburn parish of Saints Peter and John. 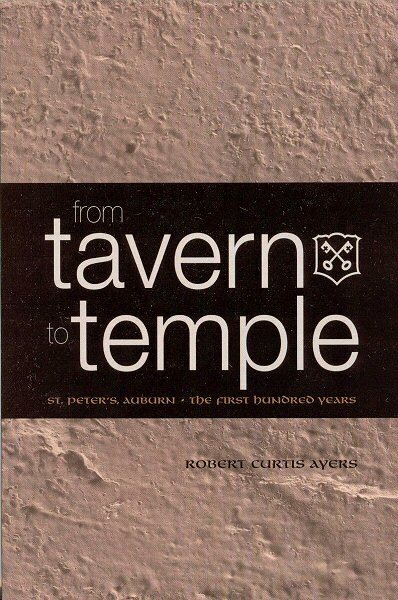 From Tavern to Temple: St. Peter's, Auburn - The First Hundred Years details the social development of the parish, with special attention to the role of women, as well as the part that individual clergy and laymen played in the development of the church. Robert Curtis Ayers is a native of Roanoke/Salem, Virginia, where he attended Andrew Lewis High School and Roanoke College. Graduating from Lutheran Theological Seminary in Philadelphia, 1950, he became an Episcopal priest in 1953. He served for 22 years as the Episcopal Chaplain to Syracuse University, and was awarded the doctorate in Philosophy in 1981 for his groundbreaking research of "The Americanists and Franz Xaver Kraus: An Historical Analysis of the an International Liberal Catholic Combination, 1987-1898." He lives near Cazenovia, New York, and is Rector Emeritus of the historic Church of Saints Peter and John, Auburn, New York.